Banjo and Buttons were designer dogs relinquished by their breeder because she could not sell them. They love playing with each other and with other dogs, but should be placed with small or medium-sized dogs only. They like toys of all kinds. Banjo has the white paws and weighs 10 lbs and Buttons is solid colored and weighs 6 lbs. As they are small breed dogs and could be hurt when dropped, we are requiring children be 10 and up. They were born on 4/26/11, which makes them about 4.5 months. 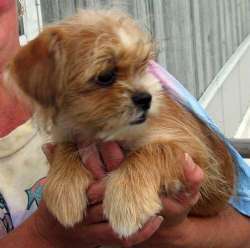 Arrival date is 9/10/11 and availability after their health exams on 9/12/11. Please, no phone calls. If you are interested, please fill out an application on our web site under Apply to Adopt and you will hear from us if you are a match. 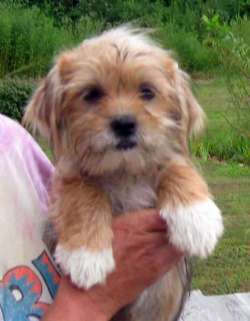 Because they are a terrier breed, children of applying families must be 10 and up. Who could resist this sweet, sweet face with such liquid brown eyes!!!! Charlie, Curly, and Lucky are 3 Lab mix pups who came into rescue in early August and just about the sweetest, most submissive pups you will ever meet. They are going to make their adopters very happy. Each one is amazing in his own way. They are healthy with nice thick, soft shiny fur and are ready for adoption. Please read up on our holistic protocol so you can save money at the vet while keeping your puppy very healthy. 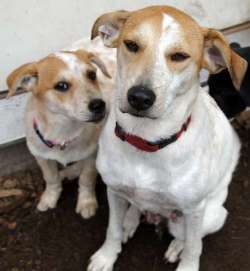 Their history: they were born on April 14, 2011 to a medium sized mixed breed female dog who appeared to have some Cattle dog in her, but the father was a black Lab. Curly has a white chest of curly hair, hence the name (but you can change the names); Charlie is all black and Lucky has a little white on his chest. They like water…love their pool, toys and playing with other dogs. They are not bad to jump up for attention, will flatten out if being picked up! They are fine in the car, they are not mouthy, but can be a little shy at first with strangers, although they warm up fast. They can hold it in their kennel from 9PM until 7AM with no accidents. They have finished their puppy boosters and received their rabies, so won't be too costly with vet visits as most pups are. These are nice pups deserving of loving homes. The ideal situation would be one with access to water or with someone who can take them to the beach or ponds to swim. They LOVE their kiddy pool and won't stay out of it. Please apply online if you are interested and we will be in touch with you within a day or two. 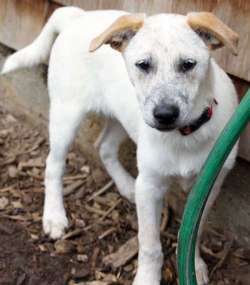 Ginger is a precious, sweet Heeler mix who came into rescue along with her 7 pups. She has several breeds in her so the Heeler part is really watered down. She doesn't have a prey drive at all. You can tell by the pictures that she is a good mom and she is happy as a clam with her puppies all around her. She can be a little shy at first, but warms up quickly once you sit with her for a few minutes. Ginger is so gentle and sweet to her puppies and to her people. She just loves affection and will sit and put her paws on your lap for attention. Everyone who meets her falls in love with her. She would love a nice, quiet home. Her foster mom says about her: She is totally housebroken…will let you know when she needs to go outside…. But no accidents at all! She is GREAT with my cats and both my Pug and my Lab. She just really wants a person! She follows me around room to room sometimes. She loves children, cats and dogs. Loves to go for walks/runs and loves the outdoors. 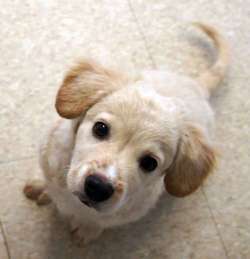 She is a super duper loyal little girl who wants to give love and be loved. Please fill out an application on our Web site and we will be in touch. Hi there! 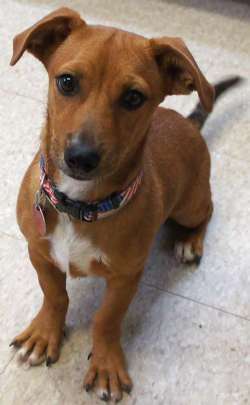 My name is Goofy and I'm an adorable neutered Dachshund mix puppy. You can change my name to something nicer as I'm really a smart dog and not too goofy. :-) Please fill out an application on our Web site and we will be in touch with you within a few days. You can meet me on weekends at our Meet and Greet events, usually held at Save A Dog, 604 Boston Post Road, in Sudbury, from 10-1PM. 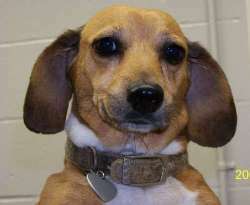 Greta is an adorably friendly Dachshund/Beagle mix. She loves to sit on your lap and loves to ride in the car. She is very behaved in her foster home, she is housebroken and LOVES to go for walks. She is currently in a foster home with a family including two children, 9 and 10 yrs old, and two dogs. 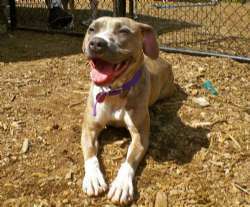 She's just an all-around easy and happy dog who will make a wonderful companion for a lucky adopter. Her story is a sad one. Her owner was evicted and abandoned her in an apartment for 3 days. When they came back they brought her and Alf to the shelter. Greta had her dental on 8/30 and the vet now estimates she's 6 years old, based on her teeth. We prefer you apply online so that we can have your application available when you come during our Meet and Greet hours to meet her. Hi there. 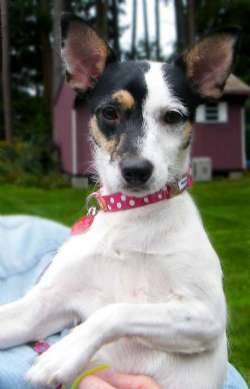 My name is Hope and I'm an adorably cute little dog looking for a home. I am around 8 to 9 months and weigh only 16 lbs so I'm a nice little dog that you can take everywhere with you. I like kids, dogs, and everyone I meet. I'm already spayed and up to date on my shots and on a holistic diet so I'm ready to be adopted. You can meet me on the weekend at Save A Dog from 10-1 either Sat or Sunday or by private appointment if you fill out an application ahead of time. Please fill out the application online so that Save A Dog can email you about me. I am originally from TN. Here's what my foster mom says about me: Just a lil update on Hope. She did great in the car on the way home. She did great in the crate, kept herself amused. I let her out after about a half hour to meet the boys. She growled a little initially and then everyone was fine. She is awesome, very well behaved, doesn't bother anything in the house. She loves to be with her person but isn't clingy. She plays nicely with my dogs. She loves going for walks and does pretty good on the leash, takes instruction great. She had no accidents at all, she waited till i took them all out this morning and did her business. She is going to make someone very happy. Great dog! Please fill out an application if you're interested, or come to one of our Meet and Greet weekends. GREAT NEWS! JACK WENT TO SPRINGER RESCUE AND HAS A PENDING ADOPTION! Meet Jack. 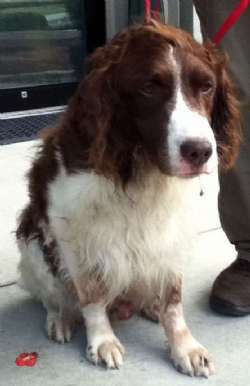 He’s a handsome and youthful 9-year old Brittany whose elderly owner died recently. Jack was with him for 3 days before being discovered. Jack has had some bird dog experience with his owner, but we're not looking for that. He just needs a new human to pal around with. Maybe you know of a retiree who needs a pal. He’s currently in northern Maine for 2 weeks of training, working on his leash manners and general obedience. He’s a large Brittany – about 50 lbs – and in good shape. His vet updated everything for us and neutered him, so he’s ready to go. He gets along well with other dogs but would prefer a home where his owner can focus on him, and take him on long walks or runs in the woods. He does bark some, and his trainer is working on correcting that, but his adoptive home would need to follow through on his training and continue it. Please consider giving Jack the home he deserves. Keisha is a local stray Pitbull mix who is tall like a Boxer. She has a grey and brindle body and white paws and white on her chest. She's great on leash, doesn't pull when you're walking her. She knows to Sit and give Paw. She likes stuffed squeakies and her favorite is the unstuffed fox. She LOVES the water, loves to swim and ducks her head under. She's good in the house and quiet in the crate. Her pictures don't do her justice as she's so pretty. She weighs about 50 lbs and is about 2 years old, if that. She's really friendly and gets excited whenever she meets new people. 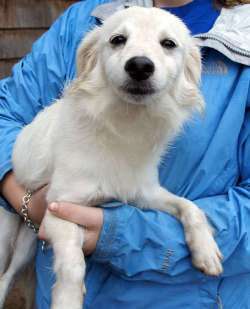 She has a really nice temperament and is very friendly, so would make someone a wonderful dog. She's an ambassador for the breed.Her foster mom says: Keisha was a joy to have. She was very well-behaved in the house and could entertain herself with toys or bones. I took her on a run with me when we got home and she did very well so would be a great running or walking companion. She loves to be with people and followed me from room to room and lay down right by my feet when I sat down. She cried in the crate for about 10 minutes, but settled down and slept through the night for 8 hours without a sound. If you are interested, please fill out an application on our Web site and watch for our Meet and Greet hours. 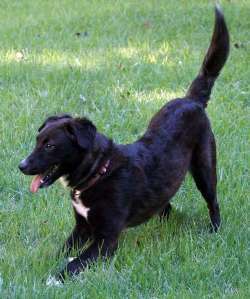 Lacy is a one year old female mixed breed mix (listed as a Lab but we don't see it). She is about a year old and has the brightest teeth typical of a young dog. As a pup she was tied out and ignored, so much that she outgrew her collar and it became embedded in her neck. She was treated for her wounds and is now ready for adoption. She has never held it against people and has the most beautiful personality. She's gentle with everyone she meets and she likes to bounce around the back yard sniffing and playing. She will gently put her paws up for attention, but not in a pushy way. We see her blossoming at the shelter and can't wait for this flower to unfold in her new home. Please be the most wonderful, dog-loving people. She deserves all the love and attention she can get. She loves kids and is great with other dogs. She has medium energy and loves to play. She's good in the car, friendly with everyone she meets. She hasn't been cat tested, but she has been fostered with other dogs. She sleeps in a crate at night. She will be available on 9/12/11. Who could resist this sweet, sweet face with such liquid brown eyes!!!! Charlie, Curly, and Lucky are 3 Lab mix pups who came into rescue in early August and are just about the sweetest, most submissive pups you will ever meet. They are going to make their adopters very happy. Each one is amazing in his own way. They are healthy with nice thick, soft, shiny fur and are ready for adoption. Please read up on our holistic protocol so you can save money at the vet while keeping your puppy very healthy. 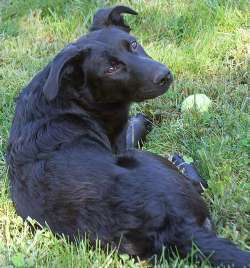 Their history: they were born on April 14, 2011 to a medium sized mixed breed female dog who appeared to have some Cattle dog in her, but the father was a black Lab. Curly has a white chest of curly hair, hence the name (but you can change the names); Charlie is all black; and Lucky has a little white on his chest. They like water…love their pool, toys and playing with other dogs. They are not bad to jump up for attention, will flatten out if being picked up! They are fine in the car, they are not mouthy, but can be a little shy at first with strangers, although they warm up fast. They can hold it in their kennel from 9PM until 7AM with no accidents. They have finished their puppy boosters and received their rabies, so won't be too costly with vet visits as most pups are. These are nice pups deserving of loving homes. The ideal situation would be one with access to water or with someone who can take them to the beach or ponds to swim. They LOVE their kiddy pool and won't stay out of it. Please apply online if you are interested and we will be in touch with you within a day or two. Maya is a 4 year old female Yorki-Poo who is looking for a loving adopter. She LOVES to swim and loves squeaky toys. She was with one family for her entire life, but as the family has grown she has gotten fewer walks and is no longer the princess she used to be. She is afraid of the toddler and was spending too much time hiding out in her crate, so her mama gave her up in hopes she will have a better life in a quiet home. She has always been an only pet, but has done ok with the groomer's dogs and is doing fine with a Golden Retriever in her foster home. She has a box of toys and has her favorites from the pile. You can see from the photos that she was a well-loved and doted on dog. She is spayed and up to date on vaccines. She had surgery a year ago to repair a luxating patella and it healed beautifully so she can run and play and swim. She swims in her foster mom's inground pool like a little fish. She is a healthy, active dog. We feel a quiet home, toddler-free, would be the ideal situation for her, maybe with someone who lives near water or someone who likes to take daily walks. She will be very loyal to her people, but might need someone with patience at first so that she can settle in as she is a bit timid in new situations. 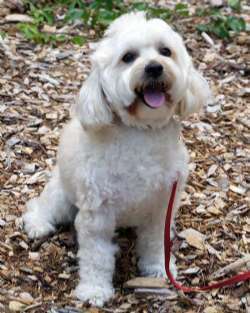 She is a small, non-shedding dog, about 15 lbs with a curly poodle coat that will need grooming every six weeks. She knows how to sit, stay, and give paw and is adorable in many ways. She was very accepting of the baby and even protective. She can be a bit protective on leash when she is being walked by the one she bonds with (so will need additional training). If you are willing to let this little gem into your heart, you will have a friend for life. Please fill out an application first so we can review it before you come to meet her. 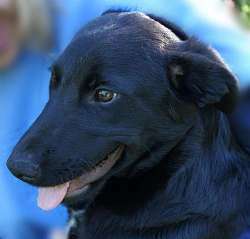 Melly is a wonderful 2 year old female Lab/Dobie mix who is bouncing back from the chore of nursing 9 chubby puppies. She is a great dog and is up to date on basic vaccinations. Melly is such a sweetheart. She is more beautiful in person than in her photos. Melly is a Lab mix, but looks like she may be part Doberman. She is now spayed and ready to join you in her new home. She is very gentle with everyone she meets and is a favorite of the volunteers. She rolls over on her back when she meets you. She plays with her puppies and acts like a puppy herself. She likes to chew on a bone, but hasn't shown interest in toys or stuffed animals, so might be safe with your stuff. :-) Background: Melly has been cat tested, dog tested and child tested. She is gentle with children. She keeps a wary eye out on the cats and is a bit scared of them. With other dogs, she tries to be friendly. 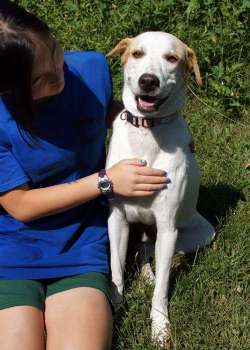 She had a kennel mate in WV so is good with other dogs and not food aggressive. Available August 1. Please fill out an application if you are interested in meeting her. This is Mika, a much-loved and doted on foster dog who was rescued from a high volume shelter in Florida. She is 11 months, and weighs 28 pounds. Her foster mom has been training her and she is ready for her new, forever family. She walks nicely on a leash, loves to be brushed, cuddled, and petted. She knows "come", "sit", "paw", " leave it". Her favorite hobby is chasing lizards and squirrels. She is everyone's favorite dog at the dogpark and has never met a dog she couldn't get to play. She likes to be chased in large circles by the dogs around the park and also loves to play tug of war with other dogs with a stick or rope toy. The other dogs' owners call the foster mom on the phone to find out what time we are going to the park so that their dogs can get exercised by Mika. She absolutely loves to cuddle, kiss, wrestle,and simply be as close as possible to her dog friends so she would make a perfect playmate for someone with an exisiting pet. That being said, when another dog has had enough and lets her know, she is very submissive and takes the hint. Cat tested with a kitten at the vet's office- she was gentle but curious and now every time she sees a feral cat outside she wants to go play with it. Should be fine with cats I think. She is timid when she first meets someone, but warms up very quickly. Same with children- has had many a fun afternoon running and playing with children at the park. And she very tolerant. She is housebroken, but is babygated in the kitchen as she has chewed some odd things in the past- and has a weird habit of stealing random items of clothes and shoes and putting them in a pile in some out of the way place. 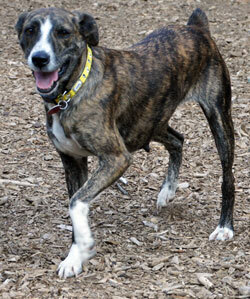 We think she'd be a perfect family dog as long as the family keeps up with the training and exercise. If you're a super busy family whose kids have active after-school activities, then she is probably not the dog for you. She's going to need her own time, attention, and training. Formal obedience training is required even if you have trained dogs in the past. Please fill out the online application on our Web site so that we can begin the process. Chandler, Emma, Joey, Monica, Nora, Phoebe, and Rachel are recently rescued puppies, born in early June, who have been fostered with their mother, Ginger, who is a beautiful, mild-tempered, gentle 30 lb. red Heeler mix. They have all been fostered since 5 weeks old and are good with all animals and respectful of cats. Because they're still together in the litter, they can be a little shy at first, but will warm up quickly. They love to play and have sweet temperaments. Please fill out an application on our Web site and we will be in touch with you within a few days. They will be shown on weekends at our Meet and Greet events, usually held at Save A Dog, 604 Boston Post Road, in Sudbury, from 10-1PM. Nikki is a SUPER FRIENDLY 32 lb. female Boxer mix who wants to come home with you. What a fun dog. She likes to play, but is also very affectionate. She gets along with every dog she meets and she gets a real kick out of the puppies too. She was a stray and was thin when rescued, but she is nice and healthy now. She likes kids, likes to play, loves other dogs, is curious about cats. She's leash trained, travels in the car well, and is a submissive dog with other dogs. She's a sweet dog who will need love, affection, and training. The pictures don't do her justice as she was real thin when she was rescued. She was wandering around a neighborhood in rural TN and people were threatening to shoot her so a kind dog lover rescued her. 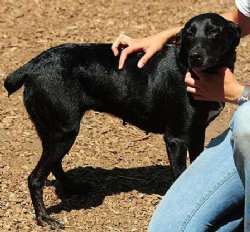 She will be arriving from TN on 9/10/11 and available after 9/12/11. The best way to start the process is to apply online. It's free and it allows us to begin the adoption conversation with you before you actually come to the shelter. Phoebe is one of a litter of 7 pups who came to us recently. She has the longest white eye lashes and is one of the prettiest puppies as she's all freckles, but it doesn't show up in the pictures. You'll just have to come and meet her. She's sweet and gentle. These pups are all gentle and do not have the typical Cattle Dog characteristics. Chandler, Emma, Joey, Monica, Nora, Phoebe, and Rachel are recently rescued puppies who have been fostered with their mother, Ginger, who is a beautiful, mild-tempered, gentle 30 lb. red Heeler mix. They have all been fostered since 5 weeks old and are good with all animals and respectful of cats. Because they're still together in the litter, they can be a little shy at first, but will warm up quickly. They love to play and have sweet temperaments. Please fill out an application on our Web site and we will be in touch with you within a few days. They will be shown on weekends at our Meet and Greet events, usually held at Save A Dog, 604 Boston Post Road, in Sudbury, from 10-1PM. Do you want a happy dog whose tail will never stop wagging? If so, Regina aka Reggie is the dog for you! She is a good-natured female dog, eager to please. 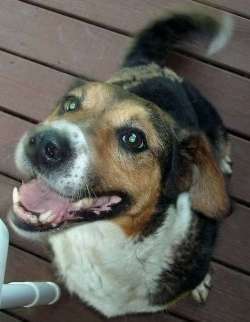 She is a mixed breed, possible some Shepherd or Sheltie mixed with Beagle or Basset. She is about 55 pounds so could lose a few pounds. Teeth are healthy and mostly white, probably 7-8 years old. She is currently shedding her coat in the pictures. She obeys very well, sits, lays down, heels, understands NO. Comes when called (using a temp name "Reggie"), or when whistled for. Only ever barks when someone pulls up in our driveway, but is not aggressive. She was submissive with the neighbors 3 dogs. Follows closely when we take walks and is very friendly and affectionate. As far as we can tell she seems very healthy. Needs loving home. She is available 9/12/11. Rocky is an adorable 4-year-old 28-lb mixed breed, perhaps Corgi and retriever, who had lived with a family for three years until the baby developed an allergy to dogs. He will bond quickly to his caregiver and be a loyal companion once he gets used to his new surroundings, but he will need a patient person who understands dogs, who can read their body language, and who will allow him the time to settle into his new home. He has been in a foster home for a number of months doing some training, and has become a treasured member of his foster family and their female dog. He loves treats, so is motivated and responsive to training. Rocky is housebroken and well-behaved in the house. He’s a good watchdog and will bark if someone is at the door, but is otherwise quiet. He has a medium energy level and loves to go for leash walks on the road or run off leash in the woods and fields. He loves looking for mice and chipmunks and will hop over a log with the greatest of ease when he's in pursuit of a chipmunk. 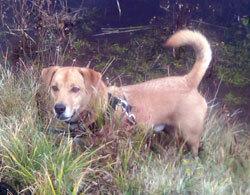 He also loves to swim in ponds with the geese and can swim for a long time. He would make a great boating dog and he’s a nice size for it. He gets along well with all dogs that he meets and has gone to doggie daycare in the past. Rocky can be nervous when meeting new people and occasionally has snapped without breaking the skin. Because of this, we will not allow him to go to a home with children. He will probably do best in a rural or suburban environment. You can meet Rocky at his foster home. Hi there. My name is Smiley and I am just adorable. I'm small, about 15 lbs if that. I like to play. I am looking for a new home, so please fill out an application with Save A Dog if you would like to meet me. Thanks so much! Xavier is an adorable 12 week old Cocker Spaniel pup. He is a mix, but you can see a lot of the spaniel in him. He is very cuddly and he loves to play with the other puppies. He like keep away, likes to chase and be chased and will sit in your lap and fall asleep. It's hard to believe a puppy this young and cute was a stray. He is so delightful and cute and seems very healthy too. Please read our guidelines for adopting puppies as the rule of thumb is not more than 1 hour alone for each month of the pup's age, so no more than 3 hours alone total for the day. Puppies need socialization in order to develop properly and we are looking for an adopter who will make a life-time commitment to this adorable pup. If you have children, you will need a fenced in yard. We have a list of the inexpensive kind on our web site under Appy to Adopt. No phone calls please. The application is on our web site.